New Virtual Horse Racing at Bovada! The horse racing season is most definitely upon us and although the Kentucky Derby is done and dusted there are still two huge races left in the Belmont Stakes and of course Preakness. Just in time for the big races is a brand new online horse racing game from Bovada Casino, and although it's not the real thing it sure offers some fun and plenty of race day excitement. 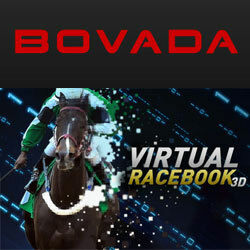 The game is called Virtual Racebook 3D and is a great new addition to the already fantastic offering at Bovada Casino. Virtual Racebook is a fairly simple game to play and enjoy, and if you are a horse racing fan already then this will be a walk in the park. This game is different to most virtual horse racing games in that you may choose multiple bets, you can check stats and place bets that are informed rather than guesswork. You may place single bets, you can lay, place forecasts and tricasts and enjoy it all live in the comfort of your own home. You may place up to 10 wagers on each race and the maximum is $250 per wager and after adding your choices to the betslip you simply press begin to watch the race. A few tabs to look out for are the Bet Slip Tab where you may view all of the wagers you have made and the Bet Form Tab which will give you statistics on all of the horses in the race. Using a single bet as an example, to add this you need to use the + and - buttons to adjust the amount you wish to bet on each horse and you stake and possible returns will be shown in the box below. You then need to click begin race and if your horse wins your cash is in your account immediately. Placing other types of bets uses the same buttons and as you place them you'll see them appear on your bet slip. It's simple, and it's fast and fun giving you a fantastic new option at the Bovada Casino. The New Bovada’s Virtual Horse Racing consists of several quick links to the Dubai World Cup, Grand National, Kentucky Derby, The Kentucky Oaks, and Futures and Propositions. The live feed is visible to bettors when you click on any of the above links. For example, Horse Racing Futures will display the upcoming races for all of the sites mentioned above for 2019. You will also be given the month and time of the race and the American Odds. You will find a “preview sheet” to view the horses name and the Jockey’s name, too. The Bet Slip is shown to the right of the page. Also to the right of the page is the Help button. This will give you a comprehensive tutorial on everything you need to know about virtual horse racing. This is located under the FAQ section and will be very helpful to first time bettors. Bovada offers wagering on thoroughbreds, quarter horses and harness races. If you’ve ever attending horse races at any of the major tracks, you’ll know how to play. If not, we refer you again to the Help section where, after you peruse it, you’ll be a pro.